When it comes to early financial independence and creating wealth for yourself, I truly believe that the best opportunities ONLY ever present themselves at the bottom of brutal bear markets. Fortunes are made when we go against the grain, back up the truck, and acquire the very best assets at bargain basement discounts. Investors who have not been so fortunate before to buy at the bottom are quick to dismiss this investment philosophy as one that is based on nothing more than wishful thinking and pure dumb luck. The detractors argue that you cannot time the market so you should not even bother to try. Further, they always like to throw claims out there that “so-an-so” did a research study and it proves without a shadow of a doubt that time in the market trumps all else. In other words, just stick to buy-and-hold index investing and stop trying to be so fancy!!! Buy when there is blood in the streets. In the short-term, the market is a voting machine, but in the long-term it’s a weighing machine. Well, just what do you suppose it means to “buy low and sell high”? How can an investor ever hope to “sell high” if they never “buy low” in the first place? Yes, that’s right, the retail investor always gets euphoric near the top of the market. Consequently, when the market finally decides that it is time to alter course, these very same retail investors are the ones who get left holding the bag. When markets turn, and they ALWAYS do, you have to have winners and losers. One thing is for certain, there is no one to ring the bell at the top to give you a warning before a fatal crash happens (wouldn’t that be nice). Leave some for the ducks. Recognize when the ducks are quacking and that’s when you know it’s time to feed them; that’s when you sell. However, when retail investors see the share price of a stock they own continue to go down in value (even if it was already undervalued when they first bought), they panic and freak out. Instead of using the precipitous decline as an opportunity to average down and lower their cost basis, they get emotional and either sell, or just stop paying attention completely. But investors need to ask themselves this — If you had the conviction to purchase a stock at $X, And now it is trading down 20%, or 30%, why is it that you are not buying more? If the fundamental story is not broken, why are you tripping out and basing your investment decisions entirely off of your emotions? Yup, that’s right — currently, I’m down about 10% and over $22,000!!! But in no way, shape, or form am I freaking out… or losing any sleep over unrealized paper losses. In fact, I can only hope for prices to go lower so I can buy even more cheap inventory! What gives me such courage? Because I know that I am buying at near the bottom! Many of the stocks that are in my portfolio are down 80%, 90%, or more from their 2011-2012 highs… So, in theory, they should be FAR LESS RISKY NOW! I am basing my investment decision based off of fundamentals and conviction, not emotion. But if the script was flipped and my portfolio was down $22,000 (crashing down from all-time high levels, instead), then yes, I probably would be PETRIFIED and SCARED SH!TLESS right now! If it isn’t emotion that prevents an investor from buying at the bottom of a market than it is probably due to a lack of conviction… which can be equally crippling. So many investors that I know personally missed out on buying Bay Area real estate between 2009-2012 because they were always straddling the fence on the sidelines and could never make up their own minds on what to do. Without conviction, you will NEVER take the initiative to make a move because you will always be looking for someone else to act first. Too late… The best deals (found at the bottom of bear markets) don’t sit around waiting for the indecisive investor… They get swooped up almost instantly. You snooze, you lose. Many of my own friends and co-workers got the memo late and are just now looking into buying Bay Area real estate! In order to have any kind of conviction in your investing, you must FIRST get properly educated. Recently, I had coffee with an aspiring real estate investor. This guy was younger than me and wise beyond his years. He knew full well, without me having to point it out, that local real estate is not very cheap right now. But instead of ignoring the space entirely, he’s taking out the time to: attend open houses, research neighborhoods, run cash flow numbers, network with other investors and agents, and just expand his knowledge base. By taking the time to educate himself now, he knows that he will be ready to pounce upon any market corrections or crashes. So, if the price of a townhouse in Santa Clara drops to the aforementioned $200,000, he will have the knowledge (which reinforces conviction) to act accordingly. Without knowledge, an investor will simply blow with the wind, moving along aimlessly. Another important reason why retail investors don’t like to buy assets at the bottom of a market cycle is because they are myopic and not forward-looking enough. For instance, in the current landscape that we are in, commodities are trading at, or near all-time lows. But anyone who bought into these stocks over the last 4 to 5 years has been mercilessly punished, over and over again, for their early entry into this space. As it pertains to mining stocks, the time is not yet right for the sector to turnaround. But it will someday… That much is a certainty. The forward-looking investors see the future, not the present. The critics, many of which are retail investors, will only point to the fact that these resource stocks have performed terribly in the short-term… Thus, (using their asinine logic), these very same stocks ought to continue to underperform other asset classes well into the future… for perpetuity. Buy really, really, really, really low. Because when you do that (assuming you are buying high-quality assets), you are destined to succeed… eventually. No one can perfectly time market tops and bottoms but that is entirely unnecessary. As an investor who is looking to create wealth for themselves, the only thing you have to concern yourself with is knowing how to evaluate a good deal. For myself, I’ve learned that my preference is to absolutely buy when there is blood in the streets; this is really the only way to invest when there is a lot of meat left on the bone. Once the retail crowd moves in, it’s too late to make substantial returns. You win on the buy side of the equation. To do that, you must study history and learn about historic valuations. Over a long enough period of time, eventually, the market becomes a weighing machine. That means if you are indeed buying undervalued assets, at some point in time, there will be a reversion back to the mean. This applies to: stocks, real estate, currencies, commodities, etc. 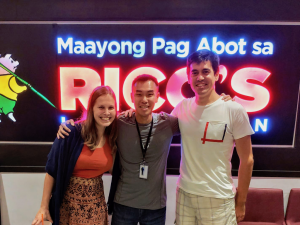 When I talk to new investors, one of my favorite stories to tell is that of my own brother, who first started real estate investing in 2012 (near but not exactly at the bottom of the market). My brother got into the game shortly before I did. I’ll never forget the first open house that we attended together… There were no other prospective buyers there. The house he was looking at was a 2/1 condo located in a very good neighborhood. Just his luck, the property was also in immaculate condition, and absolutely turnkey ready. The seller was in distress and needed to sell ASAP (he was moving back home to Hawaii). The list price was $162,000. My brother was unsure and did not know what to do since he was brand-new to real estate investing at the time. But luckily for himself, he had enough conviction to know that he didn’t want to miss out on this opportunity… He offered $165,000. Before closing escrow, he was starting to have second thoughts… When it came time to sign, he was shaking in his boots and could barely grasp the pen in hand. Fortunately, he was able to overcome his nerves and seal the deal. A few weeks later, he landed a tenant and was on his way to earning massive passive income. His first month as a landlord, after all expenses were paid for (PITI + HOA), he had netted ~$800/month. I was flabbergasted when he told me… $800/month in net income! That’s insane, I thought to myself… If things were really this easy, how come no one else was doing it? I asked my brother over and over again… He shrugged his shoulders… By the end of the second month, he was starting to feel pretty smart (passive income will do that to a person). So, he went house hunting again for more properties… He now had full conviction that he was doing the right thing. The best part? He bought at such a ridiculously low price that he was literally guaranteed to succeed. When you are able to generate $800/month in net income on a rental property, you have PLENTY of margin to screw up… Broken fridge? New carpet? Vacancy? No problem! When buying at the bottom of a bear market, you need no brains to succeed. An idiot throwing blind darts will emerge victorious because ANYTHING you hit will be a winner! 3 years later, that same condo is now worth ~$350,000. Gross rent is ~$2,200/month. But at the bottom of the market, there was hardly anyone buying. Almost nobody wanted to touch real estate with a 10 ft. pole! Fast forward to today, and everyone is buying (and overpaying) for similar types of properties that NO LONGER CASH FLOW! And once you’ve been through a full cycle (or a few), it becomes very easy to start recognizing patterns. Human psychology never changes and history only repeats itself. So, stick to the axioms of investing — there is a lot of truth in those statements. Don’t just gloss over them without much thought. Don’t follow the madding crowds and learn to embrace the bottom of bear markets. When you do that, you’re bound to succeed. At the near bottom of markets, suddenly EVERYONE becomes a market timing expert! First, I learn something new every day, and “madding crowd” (rather than maddening) denotes the crowded world of human activity and strife. Who knew? Second, I agree commodities are in bear market territory. However, I’m not sure about calling the bottom of the market. As recently as 2000-2006 gold prices steadily rose from like $300 to $500/oz. The inflation adjusted 2006 price of $500 in 2015 is only $590. There’s still plenty of room for miners to get crushed if gold goes to $600…. they may be down 90% today, but if they go down 98% total, you’ll be the one down 80%! There’s a lot to like about your philosophy to buy really really low and not worry about mistakes. On the other hand, I’d much rather make mistakes like you and buy real estate in 2011-2012 instead of 2008-2009. I’ll be fashionably late to this party and start buying commodities like a crazy person once prices stabilize and start to trend up! I definitely need to thank you for putting them on my radar, however. Nothing else seems unloved enough. In regards to tops and bottoms, I don’t think anyone ever really knows where we are for certain… All I know is that commodities are cheap, so I’ve started to accumulate. I’m sure you’ll be able to time this better than me, since I’m already down 10%+. Many companies are already trading for less than cash in the bank… I’m not sure how much more pain they will be able to take. We’ll see how this one goes. In regards to the inflation adjusted price of gold, John Williams of Shadow Stats has done extensive work in this area. Your emotion is not your amigo when it comes to investing. Don’t listen to your emotion. If the typical conservative crowds start talking about investing in the market because the great bull market… watch out, the market is probably about to turn. That’s the truth. Stick to fundamentals, turn off the emotions, and basically do the opposite of what everyone else is doing. Another think I don’t like from FIF is the low diversification, there’re plenty of stock down that is worth a check. And about that I’m not speaking about P&G or other less risky asset. Congrats on sticking it out and taking profits. Diversification is a personal decision; each one of us has to assess our own risk appetite. What works for one person won’t necessarily work for another. As always, very well said. You and I think alike. I have been buying all the beaten down stocks lately such as oil&gas stocks, oil&gas related stocks such as banks, REITs operating in Alberta area, mining stocks etc… My portfolio is down by about 10% this year but this will easily double or triple within 3-5 years if I keep buying cheap stocks now when there is blood on the street. People don’t realize that risk is already reduced significantly on mining and oil&gas stocks. Thanks for sharing! Deep value investing might not be suitable for everyone b/c if you play in a cyclical sector, you must have an iron stomach to weather any remaining downside… It also takes a lot of perseverance to withstand shocks year after year after year until your thesis is finally, ultimately proven correct. Oil, gas, commodities, etc. are needed by the world and the world isn’t coming to an end. When a sector experiences supply destruction (shutdown of mines) for long enough, prices have no choice but to go up. Actually most oil companies have not reduced their dividends. It is my belief they will not be able to support those hefty dividends at current oil prices and the oil/gas stocks are not yet priced accordingly. They can drop much much lower. Some companies may take on massive debt to sustain the illusion of being able to ride out the storm and pay out dividends but this is ultimately a very bad long term strategy. Oil prices go down – you lose, Oil price stay flat – you lose. They can only go up and with a slowing global economy and a soaring USD I would not bet against that. Be warned and be careful. 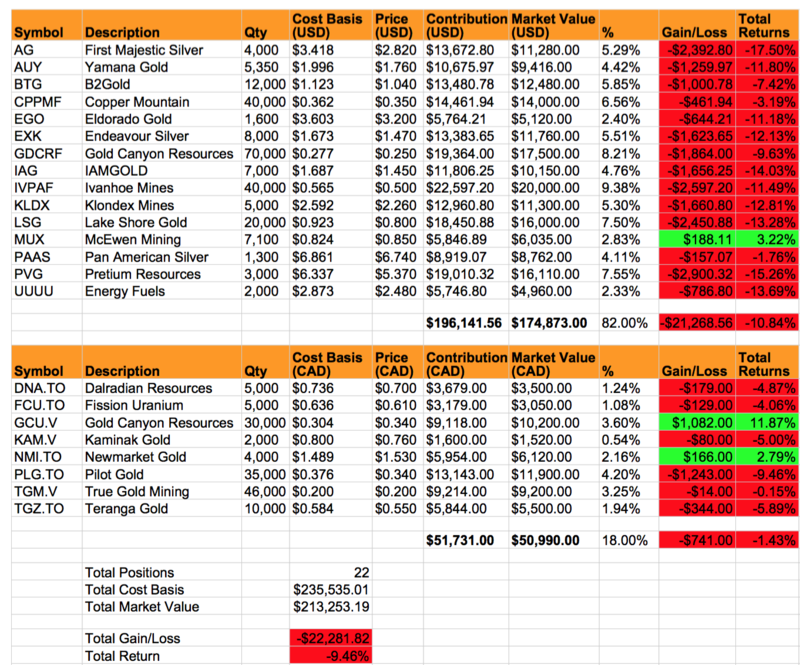 As it pertains to gold/silver miners here is my rationale for buying now — the majority of them have not only cut dividends, but there is a ton of M&A going on right now… Many miners are at or near the cost of production (but lower oil prices indeed help), and many junior exploration companies are trading for less than cash in the bank. The sector is extremely broken, which is why Keith Neumeyer and First Mining Finance, for example, are able to go out and acquire gold deposits for less than $10/oz… It’s cheaper to buy oz than it is to drill… Exploration has completely been decimated during this bear market which is not good since we’ve already hit peak gold (according to Goldcorp). Could things get worse? Absolutely… But the entire sector is already in deep pain… And with precious metals, you do get the benefit of the fear trade which could come in handy if the world economy grinds to a halt, like you mentioned. Very well said and I totally agree with you for the companies that are trying to sustain by incurring more debt. The illusion is a very dangerous thing. In my opinion, two important factors of picking a great long term stock are to analyze 1) whether the company is still generating positive and sufficient free cash flow 2) and whether the debt load is lower than competition that were also beaten down. As long as both of them are sustainable, I will buy the stocks to ride out the storm. Thanks for your comments on this and I will be very careful. Great read, I absolutely agree with you, but i also think that there is to a degree merit in keeping your cool and waiting. Trends usually last longer than we expect them to (There’s probably some other old saying on that) and that may cause some pain in the short term. I think you should also point out the need for dollar cost averaging when it comes to timing the bottom. Rather than timing THE bottom, one can probably do a series of buys on the way down, the absolute bottom and on the way up. Which should be made easier by checking historic troughs. How heavily invested are you in the mining stocks in comparison to your maximum position size you would be willing to take on? I haven’t quite hit my allocation target but I’m pretty close… If prices stay low, I might cap out at $300,000 (total contribution), but I’m more or less situated and in a comfortable position, moving forward. To hit $300k would require an additional $65k investment. More importantly, though, is I’m well diversified and also hold 8 rental properties and over $100k in cash… Just to be clear, I haven’t dumped everything into this speculation! mistakes that people make again and again. Absolutely, and if I’m going to make a mistake I’d rather much do so at a market bottom than top. A reversion back to the mean will rescue you at the bottom, but you’ll have to wait for another bull run to save you if you fall from the top. Happy Thanksgiving Fighter. I have always lived by the belief that in investing, money is made when you buy….not when you sell. It’s true in stocks, it’s true in real estate. My best investments were all the result of keeping my emotions in check, and using a patient…..methodical approach. Happy holidays buddy! I hope you had a wonderful time with your family. Same here, my best deals were made on the buy side. I’m trying to replicate that success yet again… at another bottom. Buying when other are afraid to buy is not always a good strategy. I real estate, you can at least count the cash flow, even if the asset price goes down. With Stocks, generally they go up, and buying at a discount makes sense. The problem is, how do you know when the bottom is in. Deep value investing forsakes cash flow when you can buy non-income producing assets for an even greater discount. There’s a time and place for cash flow… With the miners, I couldn’t care less with cash flow or trying to catch the EXACT bottom… We are close enough. Like many others I’m waiting and watching miners prices ready to buy at the bottom (partly due to your excellent website) but it appears possible that gold could hit $500/oz or less before that happens. Why are you investing so much without any evidence of a bottom being reached? It appears you’re risking 50%+ of your capital unnecessarily here. Unless I’m missing something there will need to be a major event to reverse gold’s decline (major market crash, war etc) and until then it appears almost guaranteed to keep trending down as interest rates eventually increase etc. I’d rather be early than late because when this thing explodes to the upside it will be very violent… And I would have no way of knowing when the next leg up is for real or another head fake. I just wonder whether you might be getting a little too emotional on your positions? Just read this post compared to others. I’m just being the objective observer. Did you buy these positions and plan to buy more with cash cash? Or is this equity you took out of your property where the mortgage grew?